The average residence or business likely has a number of devices that piggyback on mains line for communication. Recently, Haris Andrianakis decided to design his very own power line communication system for a thesis project at the Technological Education Institute of Piraeus in Greece. As HackADay’s Eric Evenchick explains, the basic principle of the system is to inject a signal onto the power lines at a significantly higher frequency than the 50 or 60 Hz of the AC power itself. Comms between the ST7540 modem could have also been established using UART (asynchronous), although as we noted above, Andrianakis chose SPI to establish a synchronous connection. “After a lot of hours of SPI debugging using logic analyzer and testing different combinations I found an unusual but working method. In order to enable the Slave’s (ATmega168) SS pin to indicate SPI’s start/stop I used another pin of the same MCU and not one of the ST7540 (while it wasn’t included),” Andrianakis wrote on the project’s official page. Essentially, says Andrianakis, this method is like deceiving the SPI while the same (Slave) device enables its SS pin. Interested in learning more? You can download the source code/ schematics here and check out the project’s official page here. 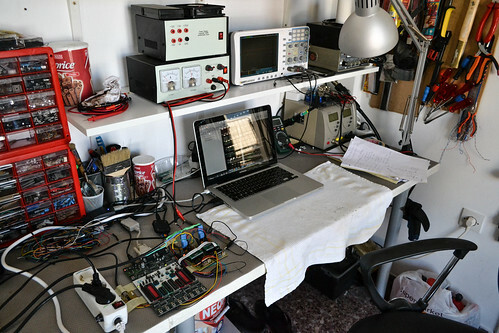 This entry was posted in Design Tips & Tricks, Engineering Perspectives, Maker Movement and tagged ATmega168 MCU, Atmel, Eric Evenchick, Greece, HackADay, Haris Andrianakis, Power line comms, thesis on April 7, 2014 by The Atmel Team. Jean-Noel was fixing a broken Lurem woodworking machine equipped with a three-phase Dahlander motor. The trio of operation modes originally included: stop, half speed and full speed. As HackADay’s Eric Evenchick notes, the motor uses a special mechanical switch to select the operating mode. However, the mechanical components inside the switch were broken, preventing the motor from being activated. How to solve the problem without sourcing a new switch? Well, Jean-Noel decided to build his own Atmel-based, Arduino Pro Mini (ATmega328 MCU) powered Dahlander switch consisting of three relays tasked with selecting the wiring configuration for each speed mode. Jean-Noel also added a button to toggle settings, along with two lamps to indicate what mode the motor is currently operating in. 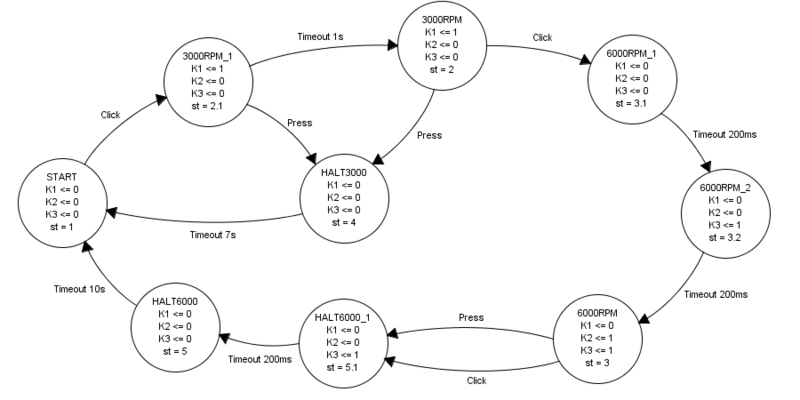 “The Arduino runs a finite-state machine (FSM), ensuring that the device transitions through the modes in the correct order,” Evenchick explained. Meanwhile, the state machine graph was generated using Fizzim, with the final product housed in a DIN rail case, allowing it to be securely mounted along with the rest of the wiring. Interested in learning more about the Arduino-based Dahlander switch? You can check out the project’s official HackADay page here. This entry was posted in Arduino, Design Tips & Tricks, Maker Movement and tagged Arduino Pro Mini, ATmega328 MCU, Atmel, DIN rail case, Eric Evenchick, finite-state machine, Fizzim, FSM, HackADay, Jean Noel, switch, three-phase Dahlander motor, Wiring on April 3, 2014 by The Atmel Team. Atmel recently expanded its wireless product portfolio with a new family of solutions targeting the rapidly evolving Internet of Things (IoT). Essentially, the new SmartConnect family combines Atmel’s ultra-low power MCUs with its wireless solutions and complementary software into a single package, allowing designers to easily add wireless connectivity to any embedded system. This new lineup includes Atmel’s SmartConnect Wi-Fi modules, an integration of the company’s ultra-low power Wi-Fi System-on-Chip with a Cortex M0+ ARM-based MCU, and the SmartConnect ZigBee SAM R21, a single-chip integrating Atmel’s ultra-low power ZigBee solution with a Cortex-M0+-based MCU. As Evenchick notes, there are two ways to use the module. “The first is as an add-on, which is similar to existing modules. A host microcontroller communicates with the module over SPI and utilizes its command set. The second method uses the module as a standalone device, with application code running on the internal SAMD21 microcontroller,” he explained. Evenchick also pointed out that there are some notable differences between Atmel’s WiFi module and other platforms on the market. “One major feature is the built in support for TLS and HTTPS, which makes it easier to build devices with secure connections. This is critical when deploying devices that are connected over the Internet. [Plus], Atmel [announced] improvements in power management as well,” he continued. Interested in reading more about Atmel’s SmartConnect lineup? You can check out HackADay’s full write up here and our original Bits & Pieces SmartConnect article here. This entry was posted in IoT, Product News and tagged Atmel, Cortex M0+ ARM-based MCU, Eric Evenchick, HackADay, Internet of Things, IoT, SmartConnect, SmartConnect ZigBee SAM R21, WiFi on March 4, 2014 by The Atmel Team. A Maker by the name of “Ojoshi” has designed a DIY intelligent hearing aid prototype powered by an Atmel-based Arduino Mega (ATmega1280). The project, originally posted to Instructables, was recently featured on the HackADay website. So, just how does the DIY hearing aid prototype work? First, the platform employs an electret to capture audio, subsequently running it through a pre-amplifier to increase the gain 100x. The next stage consists of four filters – neatly dividing the input signal by frequency into four parts, which are passed into four LTC6910 programmable gain amplifiers, allowing the Arduino to control the gain of each channel. The LTC6910 then takes three digital inputs used to set the gain value. As Evenchick notes, this hearing aid won’t quite fit in your ear, although there is quite a lot of interesting signal processing/action happening on the prototype. Interested in learning more about Ojoshi’s DIY hearing aid prototype? You can check out the project’s official Instructables page here. This entry was posted in Arduino, Maker Movement and tagged Arduino, ATmega1280, Atmel, DIY intelligent hearing aid, electret, Eric Evenchick, HackADay, Instructables, Ojoshi on December 17, 2013 by The Atmel Team.